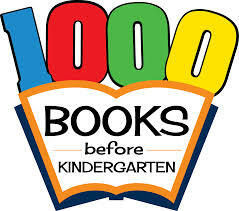 Welcome to the 1,000 Books before Kindergarten program! This free program encourages you to read 1,000 books with your child before he or she enters school. One of the best ways to encourage learning is to spend time sharing books every day. Reading together helps develop important pre-reading skills that provide a solid foundation, a key to school and learning success. Plus, sharing stories together is fun! It is easy to participate! Stop by the Youth Department to sign up. Write the titles on your log. If you read a book more than once, you can record it each time. Books read to your child at library storytime, at daycare or by others also count! When you finish 25 books, bring your sheet to the library and collect your next log. Share your favorite books with your librarian. Repeat steps 2-4 and receive a different log at each level. Each log will include early literacy tips to help you share the love of reading with your child. Be sure to check in with the Youth Department as you go. Take every chance you have to read with your children, tell and talk about stories, say nursery rhymes, sing songs, and attend library programs. By reading just three stories a day you and your child will have read over 1,000 books in one year. You will also have shared many special moments along the way. The library is a fun place featuring books to check out, free programs and great suggestions for what to read. Please stop by the library or give us a call if you have any questions. Happy reading! 1000 BOOKS ON THE GO! The New Berlin Public Library along with the Bridges Library System serving the libraries in Waukesha and Jefferson Counties, launched version 1.0 of the app last year. Now along with the partnership of eight other libraries systems, including Bridges, version 2.0 of the app is now available to download in the Google Play or Apple iTunes app stores for free (and with no ads or pop-ups!). Families can download the app by searching "1000 Books Before Kindergarten app" in the Google Play or Apple iTunes app stores. (If families prefer to track books on paper, please stop by the Youth Services Reference Desk for a packet!) Our goal is to get parents and caregivers in the habit of reading books with their children. We know that reading to a child not only improves literacy skills, but it also improves a child's ability to listen and strengthens the bond between reader and child. We're excited to offer this tool for parents and caregivers to easily track their progress. It's not only helpful because it saves a great deal of time, but it's also fun. The app now offers the option to print or email the booklist, as well as, to unlock achievements and share on social media. Whether you choose to use the app to participate in this program or participate on paper, please stop by the Youth Services Department to sign up so you can earn prizes along the way! Each library runs the program slightly different with incentives, so you will want to check out what we have to offer at the New Berlin Public Library. There a ton of books to choose from at the library (or from your shelves at home). If you're not sure where to get started or just want a few recommendations for new books to read, check out this list here.